"The Matrix" must have let his nickname go to his head. Because he's filming a reality show that no soul could possibly want to see. His immediate comp is Lamar Odom—the other swingman with a reality show—but Odom plays more, and in a bigger market. He's younger, taller, and, oh, married to a Kardashian, too. That tends to help with reality shows. It's tentatively called "The Ladies in My Life" — and big surprise ... it's all about Shawn and the important women in his day-to-day ... including his mom, sisters and publicist. One of the featured family members is Shawn's twin sister Shawnett — who's 6-feet tall and can DUNK a basketball!! "It's going to deal with me and how I have mostly all ladies in my life," Marion said Wednesday prior to the team's morning shootaround. "I'm single-mother raised and I have all sisters and I have a single-mother foundation, so it's about all that." Marion was reluctant to talk in greater detail about the show because he said he's concentrating on defending Thunder star Kevin Durant and advancing to the first NBA Finals of his 12-year career. At least one teammate said Marion is a can't-miss reality TV personality. 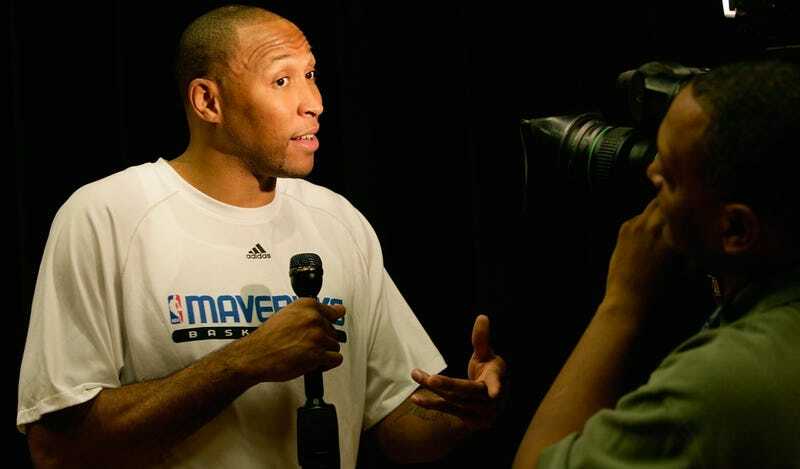 "He's actually reality-comedy every day in the locker room," Mavs guard Jason Terry said. "We always tell him he needs to get his own show." So, I have no idea what Dr. T and the Women is about, but this seems like that, only with Shawn Marion instead of Richard Gere. And I can't think anyone would sign up for that.